SMEs can apply their detailed knowledge to offer uniquely tailored big data solutions. Big data, referring to the vast and continuously growing quantities of structured and unstructured data now available to organisations, has become central to many companies’ core strategies. However, it’s not the data itself that matters so much as the ability to analyse it and obtain meaningful insights to help drive efficiencies, improve customer service levels and inform better business decisions. In this new data-driven world, there are significant opportunities available to those technology firms large and small, which are able to offer analysis and actionable insight. Often considered the domain of large global players such as IBM and Oracle, big data needn’t just be the property of big businesses; some of the real innovation in the sector is being, and will continue to be, delivered by SMEs. The evolution of next-generation broadband networks, the universal consumerisation of mobile devices, lower data and storage costs, and the emergence (and widespread adoption) of social and business networks have led to the creation and consumption of data on a scale never before seen. Most people now have a digital footprint, particularly via social media. The behavioural data shared on these networks, such as tastes and activities, has an intrinsic value for businesses who have the capacity to analyse it. If it can allow better insight into individual behaviours it can allow companies across all sectors to better service their customers. An insurance provider, for example, could examine the social media accounts of first-time car owners to analyse the resulting data to determine personality traits that are linked to safe driving, and tailor policies accordingly. As the recent Cambridge Analytica exposé tells us there are sensitivities about such data, but that doesn’t mean that there aren’t opportunities for both businesses and consumers in the compliant analysis of freely given data. Businesses are now well positioned to analyse this unstructured data. Historically, it was only realistically possible to analyse structured data sets – information with a high degree of organisation – such as phone numbers, addresses or pre-defined text strings. This data is often collected by businesses as part of their core activity and stored in relational databases in a delineated format, making it relatively straight-forward to search, process and analyse. Tools to capture and analyse unstructured data – which is not organised in a pre-defined manner – including social media content, email, mobile data, images, audio and video – are now much more accessible. Businesses can use tools such as sentiment analysis to extract meaning from unstructured data sources and transform it into structured information and voice analytics, which can unlock hidden insights from voice conversations. For example, call centre agents at MetLife are monitored for the tone and emotion of their conversations, and if more cheer is needed in their conversations, they are reminded with a notification, helping them improve customer service. The advance of cloud computing has been an important facilitator in the proliferation of big data. Technology such as virtualisation and software containerisation (providing software applications with dedicated runtime environments) has enabled businesses to effectively outsource their IT functions to third party cloud providers such as Amazon Web Services (AWS) and Microsoft Azure. These providers have the resources to invest materially in continuous improvements in cloud technology that has driven down the cost of data storage, increased cloud computing power and given businesses access to the latest technologies (e.g. security), as well as provided the innate scalability, flexibility and affordability of a cloud environment. Consequently, many businesses are seeing the benefits of moving their data into a centralised cloud environment, where it can be accessed and processed faster. This has created a virtuous circle whereby more data is being moved to the cloud, offering more opportunities to mine it for its value. 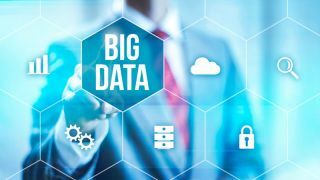 Accumulating big data allows businesses to uncover hidden information that was previously unattainable through the analysis of smaller data sets. This is achieved using technology such as pattern recognition, artificial intelligence/machine learning and predictive analytics. These new technologies are being harnessed across almost every sector to enable businesses to operate more efficiently and to better service their customers. The scale of the data itself and of the established players in this formative industry shouldn’t be underestimated, yet that doesn’t mean it’s an environment that is exclusive to the ‘big guns’ of the technology sector. Those companies may well provide core enterprise cloud computing technology around storage management or analytics, but designing specific technologies and solutions for the collection, cleansing, aggregation, analysis and reporting of unstructured and structured data, in individual vertical or horizontal markets, is something that is wide-open to SMEs. SMEs can bring to the market a deep understanding of an individual technological or sector-specific issue that needs to be addressed. While the larger players concentrate on solutions that broadly fit the entire market, SMEs have the capacity to apply that detailed knowledge to produce something uniquely tailored to specific requirements. For example, an SME could deliver a solution that addresses the requirements of retailers to understand consumer behaviour around key shopping periods, or one that uses machine learning algorithms to analyse health data delivered via connected consumer smart devices. It’s important for SMEs to identify a defined business case which can be scaled to the needs of the market and deliver tangible benefits for their customers through a compelling value proposition. There is little point trying to deliver ‘me too’ services when you can’t compete with the scale of the competition. For an SME specialising in big data, the need to develop a differentiated service for their customer is critical, but they also need to assess the longevity of the service and the underlying technological infrastructure required to deliver it. Technological obsolesce is a risk for any SME, as software can go out of date in just a few years if it does not retain its relevance. It is therefore key for SMEs to offer products or services that are technology agnostic or to anchor themselves to a well-known, well invested and established underlying technology. It is also important to be adaptive and agile as emerging technologies and approaches drive innovation that allow them to better service their customers’ or improve their business internally (e.g. technologies such as deep machine learning or predictive analytics). If SME big data specialists can offer services that complement the multinational global leaders in the space, whilst being able to adapt their technology and services to retain relevancy, there is significant opportunity for success in this thriving space.